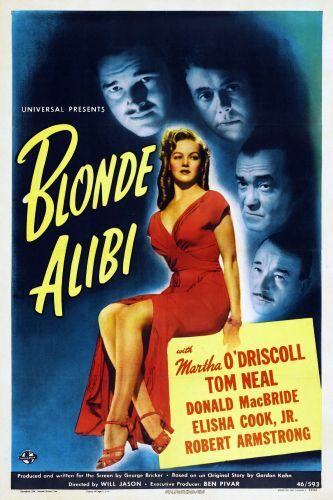 Martha O'Driscoll fills the title role quite nicely in Blonde Alibi. The plot of this rapid-fire programmer involves a murder. Aviator Tom Neal is accused of the crime, thanks to the idiotic intervention of absent-minded professor Samuel S. Hinds. It is up to O'Driscoll, Neal's secretary, to prove that her boss is innocent (Universal Pictures would later retool this plotline for their above-average "film noir" Phantom Lady). Ironically, the career of Blonde Alibi co-star Tom Neal would come to an end when, in 1965, he killed his real-life wife Gail Evatt.